“Kumon Museum of Children’s Ukiyo-e” is a digital archive that stores approximately 1,800 ukiyo-e woodblock prints from our collection. On our website you can see many exquisite ukiyo-e prints that depict the way children lived during the Edo period of Japanese history. Drawing inspiration from the efforts of a French historian Philippe Ariès, who pursued the study of children in medieval Europe by using paintings from that period, Kumon Institute of Education started building a collection of children’s ukiyo-e in 1986. The ukiyo-e prints, all thematically linked, vividly portray tender scenes of children being cherished as treasures by family members and people in the community, children being taken care of by their mothers, and children playing during various seasonal events. Scholars of historiography, educational history, children’s culture, literature and ukiyo-e conducted research into children’s ukiyo-e to study the daily life of the common people during the Edo period (1603–1868). In 2013 Kumon created an archive of the images and commentaries of the works, which can be accessed via the Internet. Some of the information contained can also be viewed in English. During the Edo period, the literacy level of the average citizen in Japan was considered one of the highest in the world. 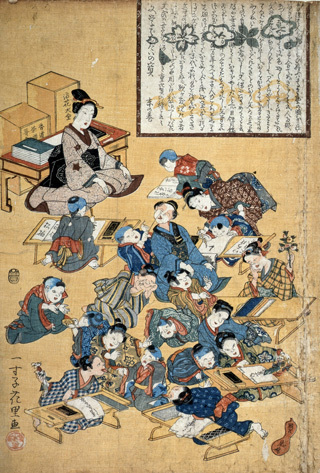 The reason for this high level of education, according to one theory, was the existence of “Terakoya.” Terakoya schools were places where children around seven years of age and older learned the fundamentals of reading and writing, general ethical principles, and the basic knowledge required for their respective professions. Ukiyo-e prints of Terakoya schools illustrate children of all ages studying in the same room with an instructor providing individualized instruction using textbooks appropriate for each of the student’s current stage of progress. 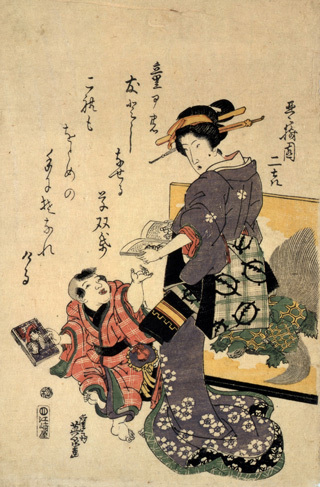 Kumon has collected 3,200 artifacts, including ukiyo-e, which depict child raising, education, and the type of play children engaged in from the Edo period onwards. Among the collection are textbooks, children’s illustrated books, and toys. We at Kumon will endeavor to continue sharing the results of our studies of Japanese culture.